We've created the world's first Spam-detecting AI trained entirely in simulation and deployed on a physical robot. Our vision system successfully flagging a can of Spam for removal. The vision system is trained entirely in simulation, while the movement policy for grasping and removing the Spam is hard-coded. Our detector is able to avoid other objects, including healthy ones such as fruit and vegetables, which it never saw during training. Deep learning-driven robotic systems are bottlenecked by data collection: it's extremely costly to obtain the hundreds of thousands of images needed to train the perception system alone. It's cheap to generate simulated data, but simulations diverge enough from reality that people typically retrain models from scratch when moving to the physical world. We've shown that domain randomization, an existing idea for making detectors trained on simulated images transfer to real images, works well for cluttered scenes. The method is simple: we randomly vary colors, textures, lighting conditions, and camera settings in simulated scenes. The resulting dataset is sufficiently variable to allow a deep neural network trained on it to generalize to reality. Randomly generated scenes. Each frame contains Spam, often hidden among distractor objects. Our Spam model is sourced from the YCB dataset. The detector is a neural network based on the VGG16 architecture that predicts the precise 3-D location of Spam in simulated images. Though it has only been trained on simulated scenes, the resulting network is able to detect Spam in real images, even in the presence of never-before-seen "distractor" items arranged in random configurations. 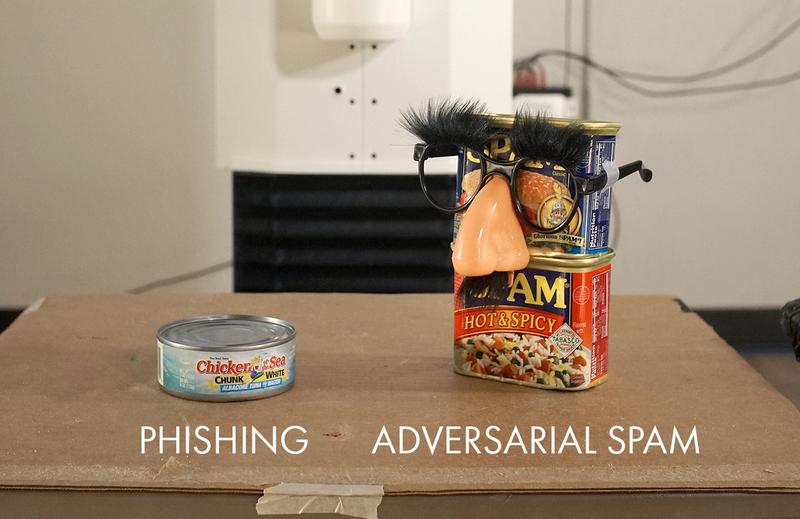 In the future, we plan to extend this work to detect phishing and to defend against adversarial Spam. If you'd like to sink your teeth into compelling applied research problems like Spam detection, consider joining us at OpenAI.